Actor and educator, Caley Vickerman, discovered haiku in 6th grade and they remain to this day a favorite method of expression; simple, precise and immeasurably powerful. It became her fervent wish to create events that celebrated haiku (and humanity). 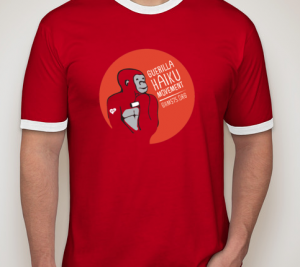 Thus the Guerilla Haiku Movement was born! …And the Haiku Mistress gratefully continues to celebrate! We are the Guerilla Haiku Movement; a cadre of artists, fun-lovers, and fools that use sidewalk chalk and the ancient Japanese poetic tradition of Haiku to tell our stories and the stories of our communities inside of one moment. Check out our events page to join us in a city near you! Haiku for Lower East Side History Month! First GHM Event hosted by Celeste in McAllen, TX! Guerilla Haiku’s San Antonian Residency! !